The sun was setting and grills were firing, either from camp sites or food trucks. 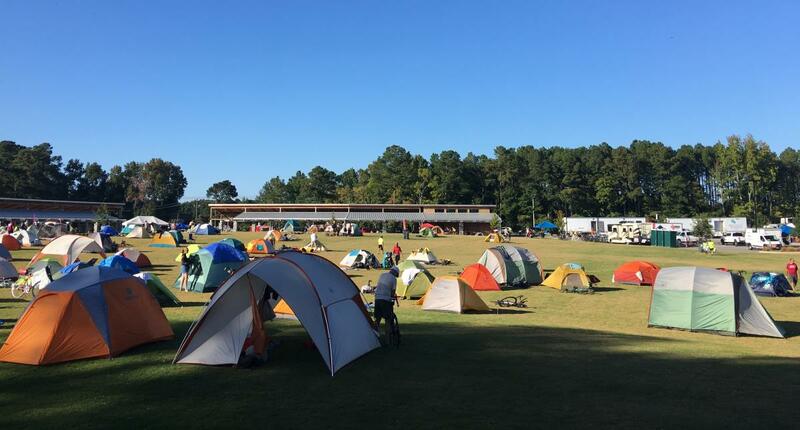 Tents, campers and RVs had been set up for the evening at Knightdale Station Park. 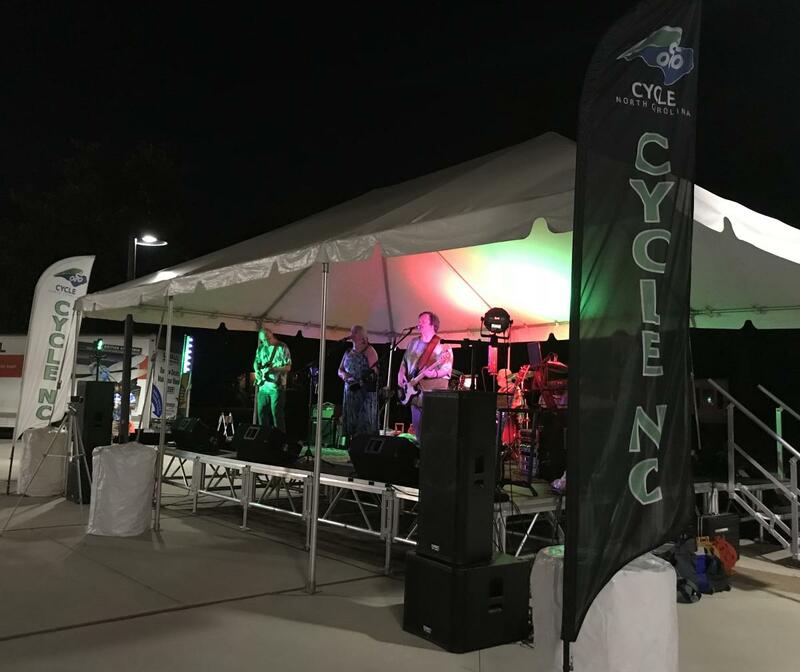 On a picture-perfect Wed., the music of classic rock band The Blenders entertained cyclists who had stopped for the night in the middle of a week-long journey across N.C. The Eastern Wake County stop was after the fourth of seven cycling days on the Cycle N.C. Mountains to Coast Ride, which brings bike enthusiasts near and far to the back roads and greenways of N.C. each fall. N.C. Amateur Sports has managed the event for 19 years, and this was the first time the itinerary gave riders a glimpse of Knightdale. About 1,100 cyclists from 39 states and several countries took part in the 450-mile event, which began Sun., Oct. 1, in the Ashe County town of Jefferson and ended Sat. on the Onslow County waterfront in Swansboro. Judging by the cyclists&apos; responses, Knightdale will be on the radar for future stops—for cycling and hospitality reasons. "After months of coordination, it came to fruition really well," said Robbie Worrell, Knightdale&apos;s director of parks, recreation and cultural programs. Worrell heard plenty of praise for Knightdale&apos;s setup, from the shade provided by picnic pavilions, to the variety of food options in and around Knightdale Station Park, to the shuttle service that transported riders to nearby shopping and dining. It was tough to remember all the places from which Worrell heard kind words: Calif., Ky., N.Y. and Penn. were just a few. 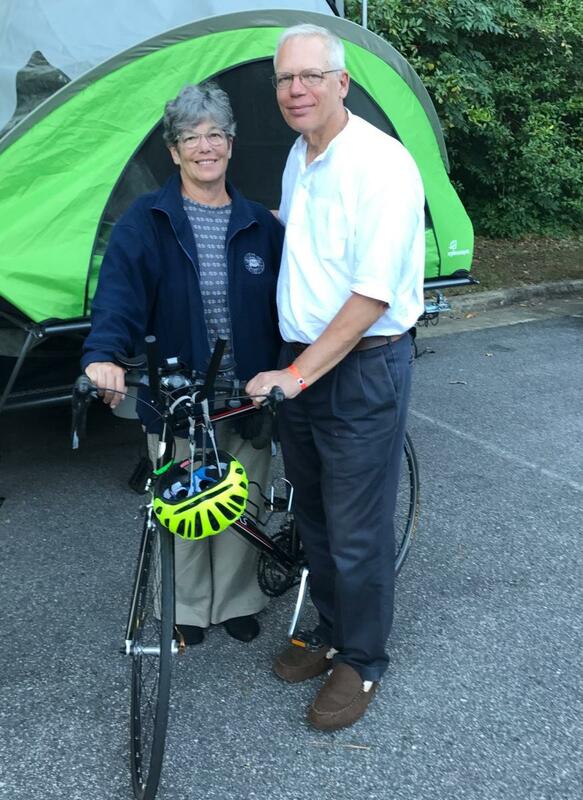 Keith Spring of Chapel Hill, who completed the Mountains to Coast Ride for the third time, heard from many more out-of-state cyclists on the roads and at the rest stops along the way. He was doing the event with his wife, Juli, and four friends—two couples who previously lived in the region but now are in suburban Washington, D.C.
"We have talked to a lot of cyclists, who have done rides all across America," Spring said. "All of them have said this ride is the most organized of any they have done by far and is one of the best. I think having the host towns involved with music, transportation and information for eateries and breweries helps to make this ride what it is." Hospitality is one reason riders enjoy the journey. When they left Knightdale on Thurs. morning, they passed through historic downtown Wendell. 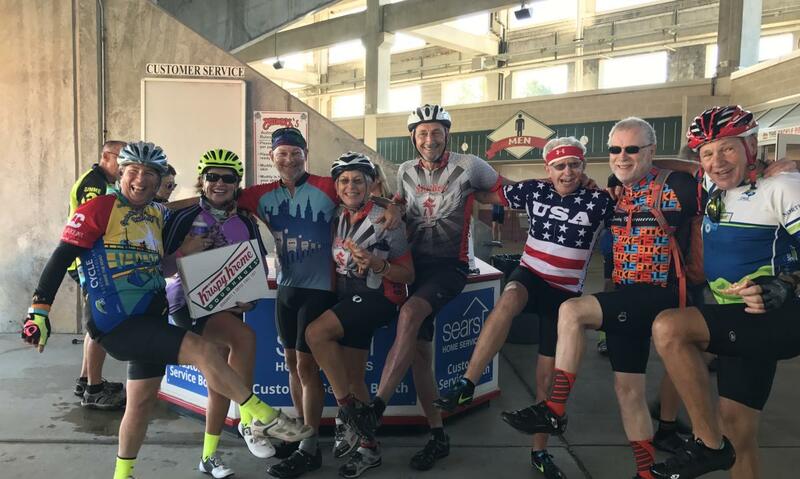 Just down the road, they had a rest stop in Zebulon at Five County Stadium, where Carolina Mudcats, Zebulon Chamber of Commerce and Greater Raleigh Sports Alliance staff were on hand, welcoming riders and distributing more than 600 doughnuts. Life in the saddle is not always easy, which is why after the fourth day of riding, Spring made time for a massage. The ride was made more enjoyable by its closing stretch in Greater Raleigh. More than 16 miles of the 66.5-mile leg, which began in Chapel Hill, were on Greater Raleigh greenways, a welcome sight near the end of the ride, when sunshine can begin to take a toll. "Especially after we got on the greenway, it was a really nice ride, shady and we didn&apos;t have to deal with traffic," said Richard Reavis of Elkin, who rode the event with his son Devin. "It was a great way to finish a ride." Richard and Devin first completed the Mountains to Coast event in 2007, when Devin was 10. These days, a 65-mile ride is no problem for Devin, who competes in USA Cycling-sanctioned road races. The competitions have taken the Reavis family all over North America and even to Belgium, where cycling is wildly popular, but the family is happy to have events such as this one that allow them to be close to home while offering new experiences. "It&apos;s a lot of N.C. that people don&apos;t get to see from an interstate," Richard Reavis said. They took advantage of an early arrival at Knightdale Station Park. They were looking forward to dinner from Cousins Maine Lobster food truck, having scouted the menu in advance. The Reavis parents, Richard and Susan, enjoyed Oak City Brewing Company, a short walk from the campsite. Spring and his group also headed to Oak City on Wed. evening. They treated the Mountains to Coast ride as a way to exercise but also as a way to bond. "It&apos;s not a race, it&apos;s a ride," Spring said. That low-key approach is shared by others, but there&apos;s room for hard-core cyclists. Some riders do a three-day option or take a day off in the middle. Others have the option to do extra miles. For example, the Knightdale-to-Wilson leg on Thurs. had the standard 62.5-mile distance as well as a 100-miler. Spring has three chief reasons for returning for his third spin across the state: Cycle N.C. puts together a well-organized, well-supported ride. The event gives him a chance to meet new people who share his interests. And, he said, "I enjoy the challenge." He&apos;s not alone in that sentiment. Ed Babel of Boone, who last did the event in 2013, wanted to complete the distance again this year, at age 67, "to see if I could." He enjoyed picture-perfect weather in the middle legs of the ride, though he took Wed. off, giving him and his wife, Debbie, a chance to see their old neighborhood in Carrboro. That also gave Debbie a day off from "sherpa" duty. So instead of Ed biking into Knightdale, the Babels drove in, setting up camp under the shade of a pine tree and grilling chicken kebabs. "This time around, it was more casual," said Babel, who rides occasionally on the Blue Ridge Parkway and was not as intimidated by some of the event&apos;s early hills.